World–wide distribution through Amazon stores, Ingram, libraries in USA & academic institutions. Milias S, Manolakoglou N, Katsoulis K, Papachristos IC, Nalmpantis A, Molyvas E, Kontakiotis T. [ Case of mucoepidermoid carcinoma of the lung: bronchoscopic findings on similar cases in Northern Greece over the last decade ] (in Greek) Pneumon 2006; 19(4):91-94. Nódulo pulmonar solitario de etiología inesperada. Archivos de Bronconeumología, July 2017 issue: Vol. 53, number 7. (You can download a .pdf file with the full text (in Greek) of the poster presentation: Solitary Metastatic Adenocarcinoma to Sternum - Resection and Chest Wall Reconstruction . “Health Education Programme” of the Senior High School of the city of Kalampaka (Coordinator: Mrs. M. Kalkani). Invited Speaker for the “Health Education Programme” on “Addictive Substances” of the Senior High School of the city of Kalampaka (Coordinator: Mrs. M. Kalkani). 2nd Regular MEETING of the Hellenic Society of Respiratory & Occupational Chest Diseases. Invited Speaker in a Round Table Discussion of the Chest Trauma Work Group. Foroulis C. Radical Lymph Nodal Dissection in surgical treatment of lung cancer. Invited Speaker in a Round Table Discussion on: "Newer Developments in Thoracic Surgery." Invited Speaker for a 1-hr Lecture at the 7th Senior High School of Trikala. Invited Speaker at the 3rd Multihospital Postgraduate Lesson organized by the University Dept. of Cardiothoracic and Vascular Surgery (Aristotle's University of Thessaloniki - AHEPA General Hospital). Papachristos I. Lecture on: ‘Pneumothorax’ in “Pleural Diseases”. Postgraduate “Hands-On Thoracoscopic Workshop” (under the auspices of EACTS & HSCTVS). Papachristos I. Lecture on: ‘Mesothelioma’ in “Pleural Diseases”. Meeting on “Diseases of the Chest, treated surgically” of the Hellenic Society of Respiratory & Occupational Chest Diseases. Thessaloniki, Greece 05 Feb 2011. “Surgical & Procedural Treatment of Lung Cancer” Round Table. organized by the “Theageneion” & “AHEPA” hospitals, in collaboration with the Hellenic Cancer Society & the Association of Cancer Patients in Macedonia–Thrace. Invited Speaker in the “War Trauma” Round Table. Papachristos I.C. : Lobectomy. How should it be undertaken ? Through an OPEN approach ? organized by the University Dept. of Cardiothoracic and Vascular Surgery (Aristotle's University of Thessaloniki - AHEPA General Hospital). Papachristos IC. [ Chest Trauma ] (in Greek) . Papachristos IC invited to comment along with: Douzinas M, Melacroinou M, Chevas A, Kritikos N.
Papaconstantinou C, Belenis I. [ Right Pneumonectomy ] ( in Greek ) . Papachristos IC Invited to comment along with Foroulis C, Didilis V, Filippou D.
Prof. Axel Rolle. LASERs in pulmonary parenchyma surgery . Desimonas N, Titopoulos F, Papachristos IC, Barbetakis N Invited to comment. Nick Baltayannis. [ Hybrid Trachea. Where do we stand today? ] ( in Greek ) . 6th Symposium of The Work Groups of the National ‘Hellenic Society of Thoracic & Cardiovascular Surgeons’. Larissa, Greece, 11-12 Apr 2014. K. Athanassiadi, G. Tagarakis. [ History - Technological Developments in Thoracic Surgery. From Hippocratic Surgery towards robotics-assisted Thoracic Surgery ] (in Greek ) . D. Filippou, P. Zarogoulidis, I.C. Papachristos, J. Angel, K. Tsakiridis Invited to comment. 6th Multihospital Postgraduate lesson in 2016 organized by the University Dept. of Cardiothoracic & Vascular Surgery. Aristotle's University of Thessaloniki, Greece 03 Jun 2016. [ Chest Wall ] ( in Greek ) session (17:30 — 19:00 hrs) chaired by: V. Vassileiades, I. Drositis, A. Dountsis. Speakers: Ath. Stamatelopoulos, Ch. Zissis, P. Tomos, N. Dessimonas. D. Garbis & I. Papachristos : Invited to comment. G. Tagarakis, E. Demiri, S. Tsangaropoulos, I. Karakasidis. [ Chest Wall Surgery ] ( in Greek ) . 4th Multihospital Postgraduate lesson in 2016–17 organized by the University Dept. of Cardiothoracic & Vascular Surgery. Aristotle's University of Thessaloniki, Greece 03 Mar 2017. “Nursing challenges whilst caregiving to lung cancer patients” Session (in Greek, March 19, 2017, 09:00' — 11:30' hrs), chaired by: C. Dimoni, A. Agapidou. I.C. Papachristos , J. Angel, S. Baca invited to comment. A. Dountsis, T. Karaiskos, C. Foroulis, N. Desimonas. A. Antoniou, A. Kleontas. [ Complications in Thoracic Surgery: prevention & treatment ] ( in Greek ) . 2nd Multihospital Postgraduate lesson in 2017–18 organized by the University Dept. of Cardiothoracic & Vascular Surgery. Aristotle's University of Thessaloniki, Greece 12 Jan 2018. G Arsos, G Philippou, K. Iliadis, S. Tsangaropoulos. [ Developments in Thoracic Surgery ] ( in Greek ) . 6th Multihospital Postgraduate lesson in 2017–18 organized by the University Dept. of Cardiothoracic & Vascular Surgery. Aristotle's University of Thessaloniki, Greece 01 Jun 2018. J. Angel, D. Filippou, A. Kleontas, I.C. Papachristos , A. Vagionas. & N. Desimonas invited to comment. One can download the: Final Programme of the 24th Conference . There is also a photograph of this session's chairpersons available. One can download the: correspondence and Programme of the Conference . “Modern techniques in NSCLC ‑ Surgical management” Round Table 16:30 - 18:45' hrs. Chairmen: D. Filippou, I. Papachristos, C. Foroulis. 2nd Symposium “Lung Cancer: from diagnosis to treatment,” The Met hotel, Thessaloniki, Greece 14 Nov 2015. “Treating Lung Cancer with Surgery” 17:40 - 21:00' hrs. Chairmen: J. Angel, Z. Diamantis, G. Karkanis, F.–P. Kokkinis, I. Papachristos, I. Sapardanis, D. Chloros. at “Hecuba” Convention Centre, Katerini, Greece, 29 Sep 2018. One can download the: Programme of the 27th Conference . 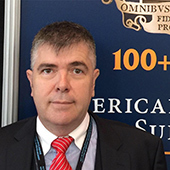 “Treating Lung Surgery Complications” session 17:00 – 19:00' hrs at the Asclepius Hall. Moderators / chairmen : N. Baltayiannis, I. Papachristos. 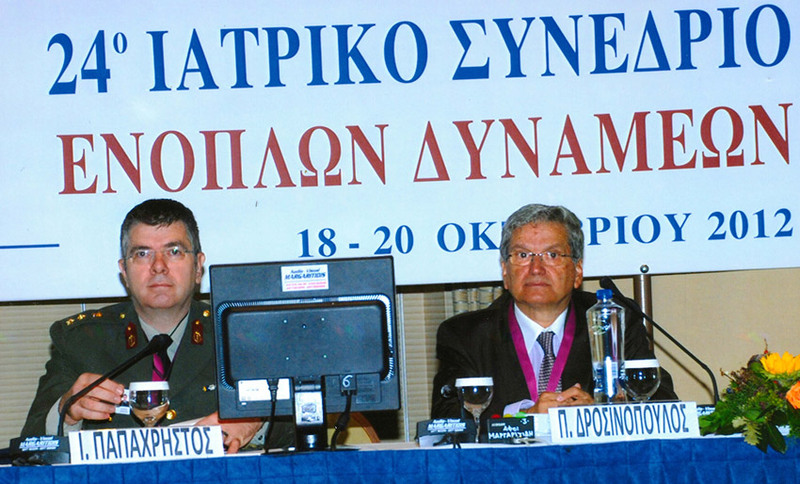 12th Congress of the Hellenic Society of Thoracic and Cardiovascular Surgeons, 2018 ISMICS Workshop (International Society for Minimally Invasive Cardiothoracic Surgery), 14th Annual Meeting Euro-Asian Bridge, 2nd World Meeting of the Hellenic Cardiothoracic Diaspora & 12th Conference of the Hellenic Society of Cardiovascular Perfusionists. Thank you for visiting this medical ( thoracic surgical ) website of mine. An additional MENU can be revealed by clicking on the PLUS symbol ( top – right ) ; it leads to the entirety of all English pages of this site to support the navigation. On the contrary, the “Main” horizontal menu ( top – centre ) only links to sub–pages, but not to their children. You might also want to browse the Writer's European site of mine.